GuideRT | TherVoyant Product - TherVoyant, Inc.
GuideRT is a revolutionary technology platform that offers an easy-to-use, Apps-based workflow interface to interactively guide surgical procedures. Real-Time MRI means images are every few seconds, not minutes, for immediate feedback during surgery! GuideRT is used for neurosurgery, oncology procedures and new drug therapies to improve surgical outcomes, improve patient care and lower overall costs. Improve the accuracy and speed at which surgical procedures can be performed to improve patient outcomes. 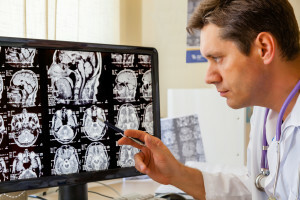 Most surgical interventions rely on retrospective (prior) MRI images of the tumor or of the affected area needing surgery, utilizing sophisticated surgical planning software. However, tissues often shift during surgery, which can compromise even the best surgical plan. Modern advanced procedures may require accuracy within one millimeter. An easily configurable interface with onscreen workflows that integrate critical medical imaging technology seamlessly for each customer and procedure. A view of the target, the surgical device, and surrounding tissue in real time, allowing for rapid adjustments to maintain the desired level of precision. Real-Time MRI means live images every few seconds during surgery! No other technology offers the speed of imaging and scanning capabilities like GuideRT. 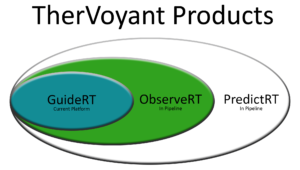 ObserveRT™ will provide therapy monitoring over time using any type of medical imaging device.